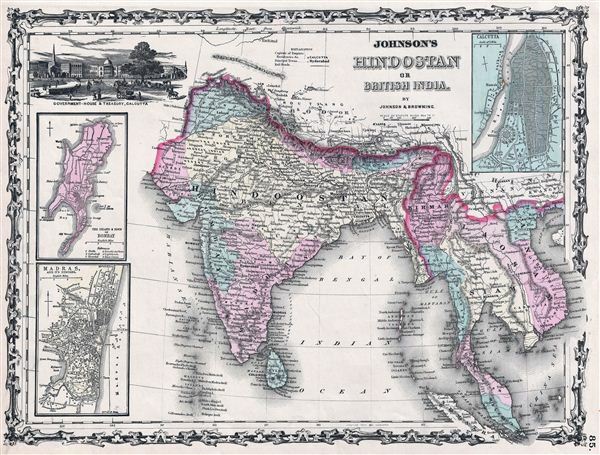 Johnson's Hindostan or British India. A very nice example of A. J. Johnson and Ross C. Browning's 1861 map of India and Southeast Asia. Covers from the Mouths of the Indus River eastward to include all of India, Burma, Siam (Thailand), Laos, Cambodia, Malaysia (Malacca). Singapore, and Vietnam (Tonquin and Chochin). Also includes parts of Nepal, China, Bhutan, Sumatra and Ceylon (Sri Lanka). Offers color coding according to country and region as well as notations regarding roadways, cities, towns, and river systems. Three inset maps focus on the Island of Bombay (Mumbai), Madras, and Calcutta. A view of the Government House and Treasury in Calcutta adorns the upper left corner. Features the strapwork style border common to Johnson's atlas work from 1860 to 1863. Published by A. J. Johnson and Browning as plate number 85 in the 1861 edition of Johnson's New Illustrated Family Atlas. This is the last edition of the Johnson Atlas to bear the 'Johnson and Browning' imprint. Subsequent editions reflect Ward's 1862 acquisition Ross C. Browning's shares in the firm.